Last year, 58% of homeowners said they planned to spend money to make their homes a little sweeter. Between new homes and home remodeling projects, a little something sweeter sounds exactly like what we need to see this year, too. The trouble is, what home design renovations should you go for? We happen to know that the sweetest things always begin in the kitchen, so we’re here to show you how to transition your kitchen from drab to fab. Without further ado, we present the aptly — yet uncreatively — named transitional kitchen. There are some things you need to know before you haphazardly start hiring remodeling contractors to knock out walls in the name of change. Just like that hairstyle you once saw definitely isn’t for everyone, so too the transitional kitchen doesn’t fit every home. And we want you to know that beforehand because hairstyles are much easier to fix than kitchen remodeling projects. 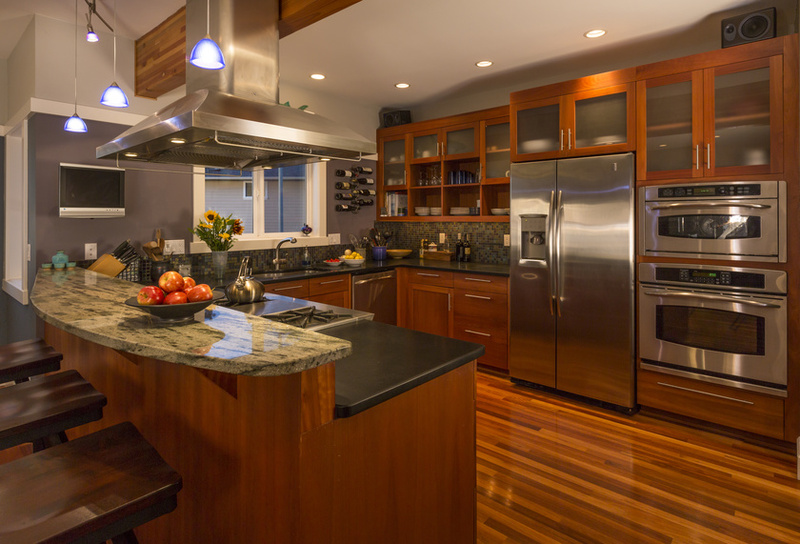 Interior designers, remodeling contractors, and transitional kitchen owners will all tell you that there isn’t a particular way to define a transitional kitchen with any rigidity. A transitional kitchen exudes blurred lines between typical kitchen elements and splashes of creative inspiration. After all, a transitional kitchen is, at the core, the marriage of traditional and contemporary designs. Still, the design variety is extensive and every transitional kitchen will differ per person, per home, and per design preferences. From mixing flooring patterns, to hybrid furniture and kitchen fixtures, transitional kitchens break rules. But, they do so gracefully. As kitchens have progressed more toward being gathering spaces versus mere cooking spaces, the transitional kitchen has blossomed. An eye-catching space that blends the function of traditional kitchen design and the fashion of transitional kitchen design is head-turning. However, creativity has its limits and a properly designed transitional kitchen is by no means offensive nor gaudy. More than a few zealous wannabe interior designers have found themselves mortified at their own choices once a transitional kitchen is put together. That’s an expensive mistake to live with, but many homeowners are set on being resistant to guidance. Swallow your pride and bring your creative ideas to professional designers, remodeling contractors, and whoever will be a part of helping you realize your dream transitional kitchen. Creativity is born from several different vantage points, so make sure to take advantage of everyone’s ability to see what you may be blind to. Is a transitional kitchen in your future? It’s worth exploring isn’t it? An excellent place to start your journey is by working with a design build home remodeling company to help you conceptualize and create whatever style kitchen you desire. Think on these few things. When you’re ready, we’re here to guide you through the remodeling process. With us by your side and your creativity to guide you, your new kitchen will scream chic..